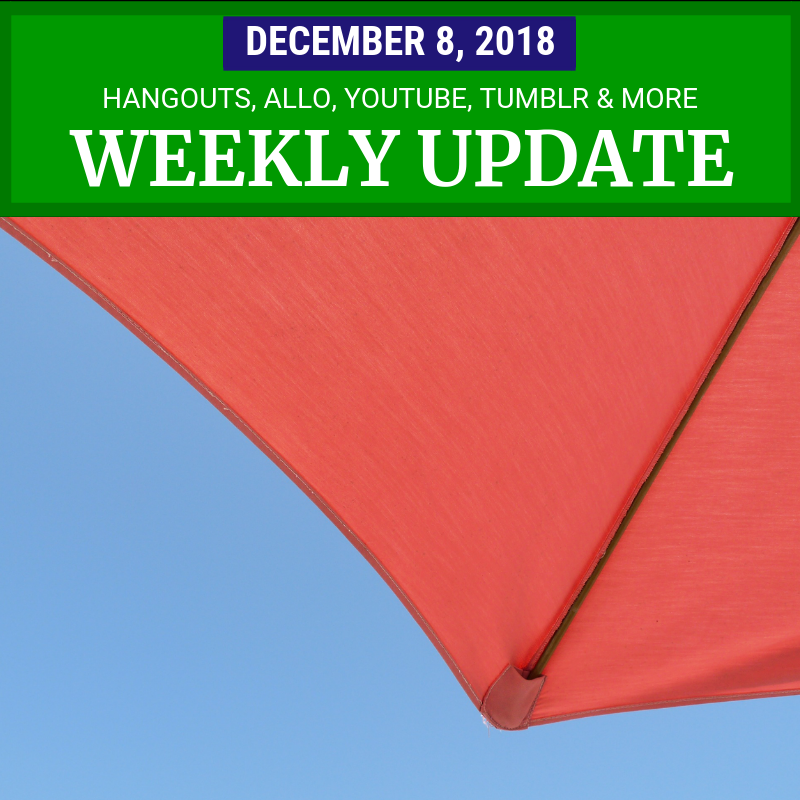 I thought December would be a quiet month, but people were talking this week about Hangouts and Google’s chat app strategy, Tumblr’s sudden ban on adult content and much more. But while Hangouts will still be around, Google also announced that “smart messaging app” Allo will be shut down in March 2019. Allo was launched in 2016 with cool features like smart replies and built-in Google Assistant. Many of those features have been been brought into Android Messages, which is Google’s new focus. Both Allo and Messages let you communicate using your phone number as an identifier, rather than having to sign in to a Google account. But Messages is also the default text messaging app on Google phones, and it supports RCS, an “upgraded” version of SMS that supports rich text, group chats and other features. Google is working with the mobile industry to try to get an RCS standard working everywhere. Duo, Google’s 1-to-1 mobile video calling app was also launched in 2016. Unlike Allo, it is still being developed and won’t be going anywhere. If you are keeping score, Messages + Duo are Google’s consumer messaging apps, while Hangouts Meet and Hangouts Chat are the business-focused services (with Classic Hangouts sticking around until Meet and Chat are available to consumers). The annual “YouTube Rewind” video was released this week, with popular YouTubers and spoofs and homages to the past year’s popular videos and memes. This is a promo for YouTube - there’s even an interlude discussing using the platform for “good” - but fans are annoyed that popular controversial stars like Logan Paul weren’t included. I suspect YouTube would like the media and advertisers to forget the controversies even happened. Ariana Grande launched her latest music video as a YouTube Premiere, and had 829,000 unique viewers watching and participating live at its peak. “thank u, next” also broke two more records: most views in 24 hours and fastest time to 100 million views. If you are using WordPress for your blog or website, sign up to beta test Google’s new Site Kit WordPress plugin. It shows metrics and insights for your site from Search Console, Analytics, AdSense, and PageSpeed Insights. Read on for links, tips and updates for YouTube creators, webmasters, the best of 2018 and more. Image: The Pantone color of the year for 2019 is “living coral” (PANTONE 16-1546, HEX FF6F61, RGB 255 111 97). This photo by thecuratedsoul on Pixabay captures that tone.